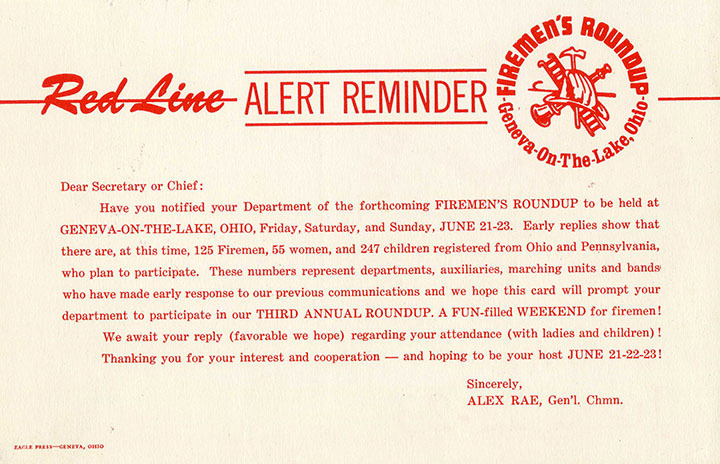 Undated memorabilia announces dates of the Third Annual Firemen’s Roundup. This event was held in the township park and included water battles between departments. Alas, it would be the last of the Roundups to be held at GOTL. The Firemen’s Roundup was a relatively short-lived effort to boost business on The Strip during mid-June, when cottage rentals often are weak. Dates of the event, confirmed by material in the collection of Jack Sargent, were 1966 and 1968. Art Hoffa was assistant fire chief of the Village Fire Department and president of the Chamber of Commerce at the time. Hoffa also owned two cottages, so he understood the pain cottage owners were facing. Wearing all three hats, Hoffa did some research on the concept of having regional departments come to GOTL for a week, campout/stay in cottages and hotels, perform demonstrations and enter competitions and participate in a parade. Elected officials from the state level and all the way up to the White House were invited. “We even got replies back from the White House,” he says. Firefighting equipment was demonstrated by dealers and manufacturers, and a water battle was staged between the departments. The event was a success and plans were made the next year’s Roundup. Ironically, Haffa did not get any renters for his cottages. “And I had 400 hours of my time in the project,” he says. 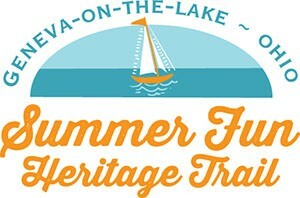 Haffa feels that the Geneva Grape Jamboree stole some of the event’s thunder in the second year. Indeed, the entire GOTL community had a change of attitude about being involved. Haffa sent out 76 letters requesting donations and food and three back, from the three families on the committee. “That’s what killed it. The community didn’t want to support it,” he says. The event was held, nevertheless, and the participants came from Ohio, Pennsylvania and West Virginia. The impetus was gone, however, and Roundup was shelved in the third year. It was revived for a final year, then laid to rest. Miss Hose Nozzle went to a Geneva woman who ran a cotton candy stand at the resort. Undated clipping, either 1966 or 1968.